Our 20kHz ultrasonic welders are used invarious feelds of industry; ex. automotive, electric, medical, non-woven, packaging, and etc. 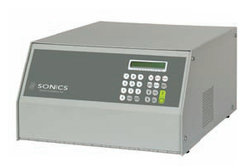 GX-Series Power Supplies offer a range of available power from 400 to 4500 watts for our ultrasonic welding presses and actuators in the 40 kHz, 20 kHz and 15 kHz frequencies. (Specific power availability is shown below.) Features include digital amplitude control, ultrasonic horn/stack frequency display and good part/bad part output signal. * Requires optional linear encoder. "T", "E", or "L" is added to the area "_" after "GX". "T" means time control model, "E" means time and energy control model, and "L" means time, energy, and distance control model. Copyright (C) Cosmo System Corporation. All right reserved.